The military history of Switzerland comprises centuries of armed actions, and the role of the Swiss military in conflicts and peacekeeping worldwide. Despite maintaining neutrality since its independence from the Holy Roman Empire in 1499, Switzerland has been involved in military operations dating back to the hiring of Swiss mercenaries by foreign nations, including the Papal States. Formed with the Federal Charter of 1291, an alliance of three cantons was formed for mutual defense, chiefly against the Habsburgs. A succession of interventions by the Habsburgs produced the battles of Morgarten (1315) and Sempach (1386), resulting in independence for the confederacy. By 1353 the original three cantons had been joined by two additional cantons and three city states. Late in the thirteenth century, soldiers drawn from the cantons of Switzerland gained a military reputation throughout Europe. This reputation was earned as a result of their defense against the Austrian Habsburg overlords and during campaigns in Italy. By the fifteenth century the Swiss had become particularly valued as soldiers-for-hire. Swiss soldiers were noted for their combat skill and ferocious attacks in the Phalanx, or deep column formation using pike and halberd. They had a virtual monopoly on pike mercenary service up until 1490. By 1490 German mercenaries became proficient in Swiss military tactics and were available for hire at a lower cost. In 1515 the Swiss pledged themselves to neutrality, and they only continued to fight in the service of the Royal French army. They became bitter rivals with the German mercenaries and the two would often fight on the battlefields of Europe during the next few decades. Following the Battle of Marignano in 1515, however, the Swiss style of massed-combat fighting went into steady decline, to be replaced by the arquebusiers, artillery and earthworks. During the Battle of Bicocca in 1522 the Swiss mercenaries saw a bitter defeat with heavy casualties. Nonetheless Swiss continued to serve as mercenaries during the next two centuries, adopting the musket to replace the pike. The Swiss Guard has its origins in 1506 when Pope Julius II hired them as "bodyguards"; however the group of soldiers was large enough to be considered an army. This is appropriate, seeing as the Papal States took up one-third of Italy at the time, requiring extensive protection. The pope enlisted them, seeing as he believed they were best at the time. Currently, it is illegal for Swiss citizens to fight as mercenaries, however working to protect the Vatican is the sole exception. The Swiss peasant war of 1653 was a popular revolt by the rural populations of several cantons. The rebellion was suppressed, but it led to a series of reforms. In 1655 and later in 1712, the Battles of Villmergen occurred as a result of religious conflicts between Catholic and reformed cantons. The religious conflicts were renewed in 1847, resulting in a civil war and leading to the formation of Switzerland as a federal state. In 1798 the French army overran Switzerland and proclaimed a Helvetic Republic. Internal resistance and economic problems destabilized the state and additional French troops were deployed to restore order. During the 1814-15 Congress of Vienna the neutrality of Switzerland was guaranteed by the signatories. In the federal treaty of 1815, the Tagsatzung prescribed cantonal troops to put a contingent of 2% of the population of each canton at the federation's disposition, amounting to a force of some 33,000 men. The cantonal armies were converted into the federal army (Bundesheer) with the constitution of 1848. From this time, it was illegal for the individual cantons to declare war or to sign capitulations or peace agreements. Paragraph 13 explicitly prohibited the federation from sustaining a standing army, and the cantons were allowed a maximum standing force of 300 each (not including the Landjäger corps, a kind of police force). Paragraph 18 declared the obligation of every Swiss citizen to serve in the federal army if conscripted (Wehrpflicht), setting its size at 3% of the population plus a reserve of one and one half that number, amounting to a total force of some 80,000. The first complete mobilization, under the command of Hans Herzog, was triggered by the Franco-Prussian War in 1871. In 1875, the army was called in to crush a strike of workers at the Gotthard tunnel. Four workers were killed and 13 were severely wounded. Paragraph 19 of the revised constitution of 1874 extended the definition of the federal army to every able-bodied citizen, swelling the size of the army at least in theory from below 150,000 to more than 700,000, with population growth during the 20th century rising further to some 1.5 million, the second largest armed force per capita after the Israeli Defence Forces. During World War I, Switzerland remained a neutral state. In World War II, Germany made some plans for the invasion of Switzerland, most notably Operation Tannenbaum, but these were never carried out. However Swiss air space was repeatedly violated. A major manoeuvre commanded in 1912 by Ulrich Wille, a reputed Germanophile, convinced visiting European heads of state, in particular Kaiser Wilhelm II, of the efficacy and determination of Swiss defences. Wille subsequently was put in command of the second complete mobilization in 1914, and Switzerland escaped invasion in the course of World War I.
Wille also ordered the suppression of the Swiss General strike (Landesstreik) of 1918 with military force. Three workers were killed, and a rather larger number of soldiers died of the Spanish flu during mobilization. In 1932, the army was called to suppress an anti-fascist demonstration in Geneva. The troops shot dead 13 demonstrators, wounding another 65. This incident long damaged the army's reputation, leading to persistent calls for its abolition among left-wing politicians. In both the 1918 and the 1932 incidents, the troops deployed were consciously selected from rural regions such as the Berner Oberland, fanning the enmity between the traditionally conservative rural population and the urban working class. 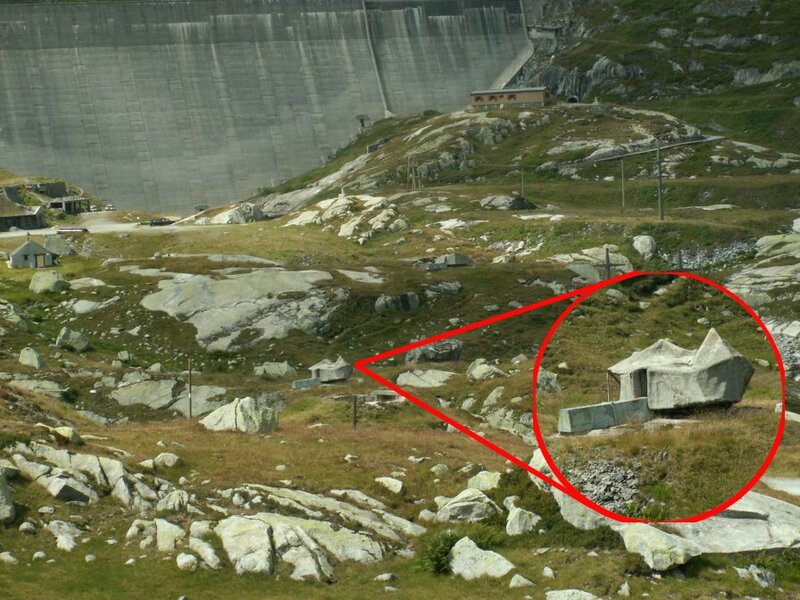 Camouflaged cannon at the Lucendro dam in the Gotthard region. It has a 105 mm calibre and fires up to range of 17 km. The third complete mobilization of the army took place during World War II under the command of Henri Guisan. Switzerland's military strategy during World War II was essentially one of deterrence. The idea was to make clear to the Third Reich that an invasion would have a high cost. Simultaneously, economic concessions were made to Germany in the hope that the overall cost of a German invasion would be perceived as higher than the potential benefits. Despite this, it is clear that Hitler intended to invade eventually and that the Allied landing at Normandy as well as the difficulties faced in invading Russia were pivotal in merely delaying an invasion. After Switzerland was surrounded by German and Italian forces, General Guisan revealed on 25 July 1940 at the so-called Rütli rapport, a meeting of the Swiss army staff at the founding site of the Swiss confederation, that in case of attack the Swiss would only defend the high Alps including the important transalpine roads and rail links. As a last resort, the army would make these routes useless to the Axis by destroying key bridges and tunnels. This plan meant that the populated lowlands - including the economic centres of the country - would be effectively ceded to the Germans. The gold reserves of the Swiss National Bank in Zürich were moved farther away from the German border, to the Gotthard Pass and to Bern. Many billions of Swiss Francs have been invested in building the fortifications in the mountains, which are partly still used by the army. The most important buildings of the Reduit were the fortifications of Sargans, St. Maurice (Valais) and the Gotthard region. The caverns of those time were equipped with the needed infrastructure, beside cannons and howitzers they consisted of dormitories, kitchens, field hospitals, rooms for the sick and bakeries; and they provided space enough to accommodate 100 to 600 soldiers for a timespan of up to several months. Because the tensions between the western countries and the USSR cooled down and bunkers became more or less obsolete because of newer weapon systems, a great number of the Reduit buildings were closed. Some of them have been reopened as museums and can be visited. In 1989, the status of the army as a national icon was shaken by a popular initiative aiming at its complete dissolution (see: Group for a Switzerland without an Army) receiving 35.6% support. This triggered a series of reforms, and in 1995, the number of troops was reduced to 400,000 ("Armee 95"). Article 58.1 of the 1999 constitution repeats that the army is "in principle" organized as a militia, implicitly allowing a small number of professional soldiers. A second initiative aimed at the army's dissolution in late 2001 received a mere 21.9% support. Nevertheless, the army was shrunk again in 2004, to 220,000 men ("Armee XXI"), including the reserves. ↑ "Switzerland". CIA World Factbook. https://www.cia.gov/library/publications/the-world-factbook/geos/sz.html. Retrieved 2006-05-25. ↑ "History of the Guard." All Things Considered. Robert Siegel. National Public Radio. ↑ World War I–Preparation in German, French and Italian in the online Historical Dictionary of Switzerland. ↑ National Defense Speeded by Swiss by C.L. Sulzberger in The New York Times, July 24, 1938. page 16. ↑ "Volksabstimmung vom 2. Dezember 2001" (in German). Federal Chancellery. http://www.admin.ch/ch/d/pore/va/20011202/det482.html. Retrieved 12 July 2009.